The 10 best Cardio machines for 2019 | Fitness Equipment Wa. Best cardio machines for weight loss and conditioning. The word cardio splits opinion and divides the world in two – half claims they couldn’t live without it while the other half wishes they could. Hate it or love it, cardio isn’t going anywhere, but your opinion of it might change if you’re open to trying something new. After all, cardio does come in many different shapes and forms. Perhaps the real challenge is merely finding the type of cardio that agrees with you. Read on to find out what the benefits of cardio are and discover the ten best cardio machines available today. What’s all the fuss about cardio? Your heart is a muscle, and just like the biceps we rarely tire of working, it must be trained to be stronger. Performing cardio exercises regularly will strengthen the heart and help prevent a series of adverse health issues from impacting your life. Every 2 people out of 3 will contract some form of cancer in the course of their life time. It has also been proven by the medical fraternity that increasing your fitness will not only assist in preventing cancer but will aid in the recovery process. Performing cardio, mainly if it is intense and done so in intervals, will significantly increase your metabolism and encourage fat burning. Moreover, intense interval-based cardio will help you stay lean. When you participate in cardio, the hormones in your body change and your body starts to release “feel good” hormones which can lift your mood and help alleviate the symptoms of depression. In addition to feeling good, these hormones can also help manage your appetite too. The treadmill is an old favourite and the staple machine of just about any gym. What’s more, it’s with good reason that this machine has lasted through the years with very minimal upgrades being made – it is effective. Mimicking our natural movement and giving you the option to increase the intensity of that movement by altering the incline or speed, you can rest assured this machine is a formidable cardio choice. The stair mill provides a challenging workout. If you thought to take the stairs to the office was an effort, imagine an infinite number of staircases. This is precisely what you will be up against when you use the stair mill. The Skierg, which resembles a standing rowing machine, provides an unforgiving upper-body workout. If you’re looking to give your lower body more of a workout, standing with a partial-squat stance will help with leg muscle activation. The aptly named Assault AirBike is just as deadly as its name implies. Essentially a stationary bike without a motor, every workout you have on an Assault Airbike is brutally intense. This is because the bike relies on a fan in the front wheel to provide resistance and the harder you push, the harder, the more intense the workout. Easy on your joints, it is a proven calorie burner that delivers an intense sweat inducing aerobic workout. This variety of stationary bike focuses on engaging the leg muscles and nothing but the leg muscles. While your legs are put to task your upper body and even your glutes are at rest. It also supports your back and is the perfect machine when recovering from surgery or injury. Initially, very awkward to get used, the never-ending ladder exercise offered by this cardio machine will end up being both fun and effective for the whole body. Once you get the pattern down, though, you can have yourself an enjoyable full-body workout. The rowing machine is tried, tested and traditional. It is a great way to engage the whole body and opting to do intervals can turn up your metabolism for an impressive caloric burn. Additionally, it’s ideal for the time challenged as 80% of the muscles group are involved without impacting the joints. The Airdyne uses a similar principle to the Assault Airbike but is more robust and has a larger fan – the harder you pedal, the more intense the wind resistance. This cardio machine is not for the fainthearted or those short of resolve. Slightly more forgiving than its sibling the Airdyne, but still known as a sweat machine, the spin bike is a worthwhile choice for getting some good cardio in. It gives you the freedom to choose the level of intensity you work at and the duration but be warned, semi prone position and sitting too long in the saddle is not without its price. Perhaps not capable of meting out a workout as challenging and intense as the other cardio machines on this list, the elliptical does offer a low-impact cardiovascular exercise that is easy on your joints. Everyone has an affinity to certain exercises, and when you find yours you won’t need to be encouraged, as you will become more focused and well on your way to becoming a better you. If you’re ready to get your daily dose of endorphins, then chat to the Fitness Equipment Warehouse. 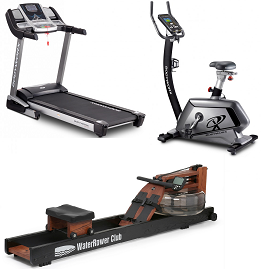 We have an exciting and innovative range of cardio machines for you to try out. Contact us today to find out more about our cardio machines.